After hearing a performance of the opera Ascanio in Alba by the fifteen-year-old Mozart in 1771, the composer Hasse is said to have commented, “This boy will mean that we are all forgotten.” His words proved all too prophetic, and now only the odd aria or overture by the composer occasionally find their way onto albums of late baroque and early classical music. The reissue of this disc, therefore, offers the chance to reassess the music of a composer who, in his day, was as celebrated as Mozart is now. 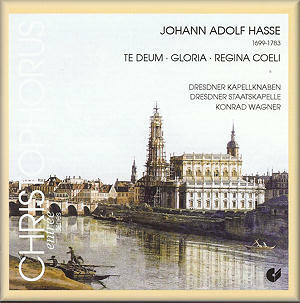 Instead of featuring Hasse’s considerable operatic output, the CD focuses on his sacred music – of which he composed a great deal. The Te Deum, Gloria (from the Mass in D minor) and Regina Coeli were all composed for the Dresden court in and around 1751. Fairly simple in construction, the works are scored for a sizeable boys’ choir, soloists and an orchestra which includes trumpets, horns and timpani. The original recording is more than twenty years old, and doesn’t stand up well to modern methods of baroque and classical performance. The players of the Dresden State Orchestra don’t use ‘authentic’ instruments, and the Dresden Boys’ Choir is often wayward and uncontrolled (especially in the opening movement of the Gloria). The sound is also flawed, with the acoustics of the Dresden Hofkirche giving it a rather brittle, vacuous quality. Nevertheless, the sheer joy and enthusiasm of the performances, as well as the beauty of the music itself, more than make up for the disc’s inadequacies. The pieces are also well-chosen for giving an insight into the life and times of this neglected composer(who counted J.S. Bach as well as Mozart among his acquaintances. The Gloria, for example, contains a blazing soprano solo (Domine Deus, track 2) which must surely have been written with Hasse’s wife, the star singer Faustina Bordoni, in mind. An equally fine tenor solo (Qui tollis, track 3) is less well delivered by Armin Ude, but reminds us that Hasse began his musical career as a tenor in the opera houses of Hamburg and Brunswick. The performance of the Te Deum is more disciplined, enabling us to appreciate its concise compositional style. Highlights include the lively contrasts between the various choir parts in the opening movement (Te deum laudamus, track 6), and soprano Andrea Ihle’s reappearance in a simple but affecting solo (Salvum fac populum tuum, track 7). The Regina Coeli feels like a bit of a filler (and the last of its three movements is simply a recapitulation of the first) in a disc that runs to less than 48 minutes. But its warmth and charm make for very pleasant listening. Alto Brigitte Pfetzschiner sounds rather stodgy in the first movement (track 10), but offers more brightness and fluency in the central Ora pro nobis (track 11). Overall, an imperfect but hugely enjoyable disc that deserves repeated listening.